After dinner speech topics including the 4 golden rules, 27 ideas, and 8 tips for delivering them at a special occasion. The main purpose of this kind of public speaking is to entertain your audience. That doesn’t mean you must avoid serious stuff. No, your second goal is to present serious information or to persuade. Relevant to you, them and the sphere of the wining and dining session itself. Besides, the whole presentation has to be funny. First and above all, offer something to think about. Give an original point of view that will inspire them. Know where you are. Recognize the atmosphere of the event or celebration. Most of the time the guests have enjoyed good food and after dinner drinks, and they are relaxed and feeling themselves good. Realize to whom you are talking. Try to flow your after dinner speech topics in the mindset and unity of the guests. Therefore also try to be on a similar wavelength. Make a choice: do you want to inform the audience about important subjects, results, or thoughts? Or to persuade them to change values, beliefs or behavior? Or do you want to set a social agenda by choosing special or noteworthy things to memorize in the drinking pauses of the evening session? Make a serious point through humorous after dinner speech topics. Not a series of unrelated jokes. Tie them together in thematic and logical structure. Apply a good sense of humor that is relevant to your message, the members of the audience, the atmosphere that evening or late afternoon and the purpose of the event. All should be well organized. By creating a clear structure will help you to find, choose and develop many useful and successful after dinner speech topics. Use transition sentences to flow your words, in order to help them understand your roadmap in a snap. Focus on humorous material that lend themselves to light entertainment – really funny jokes and oneliners. If you want to discuss very serious matters or provoking subjects, then always choose for a relaxed and humorous way. However, don’t go too far, don’t ask for radical or dramatic changes in values or attitudes. 1. Study the occasion, look around, keep your eyes and ears wide open. Connect your impressions to the central theme of the event by stating a firm, icebreaking and funny attention getter. the tradition of being together every year. And so on, to the topic or purpose of the event. 2. Tell what serious point you want to make. And why? 3. Tell why your talk is important to you and your audience. 4. Give a brief preview of the main points and arguments. Develop support. Take time to research your after dinner speech topics thoroughly. 5. A great way to be successfull is interaction. Ask for answers on a question. 6. Present results of a little poll you held earlier this day among the guests. 7. Play a simple game. Present a simple statement: Do you believe your company can reach a certain quotum this year? Then ask the guests who think Yes to stand or raise their hands. Same for the No voters. Use hilarity and laughs to develop pros and cons. Conclude with your central message. If you succeed, they remember you as well as your message in length of years! 8. Use audiovisual humor (posters, pictures, music, video or DVD) for more understanding and insight. 9. Use humorous props in your after dinner speech topics to show, to clarify, to supplement and to reinforce your message. E.g. Show a little prototype of the building your listeners have to re-decorate together. Tell about the beauty, the work stress, the achievements and about the happy people who are going to use the building. Motivate them to team work. Show them satisfaction. 10. Positive sides and possibilities. Try to turn serious and sad issues or problems up-side-down. E.g. Let them look in a real mirror. Say: ladies and gentlemen, look in this mirror. Tell who is the best, greatest, the smartest, or the finest or hardest worker. Fill in only what’s appropriate. 11. Turn negative aspects into positive aspects for a humorous effect. 12. One of the most succesfull clues is to demonstrate how something works or has been made. E.g. In case of an award presentation: ask the winner to lend the award for a few minutes. Then hold it up, and tell how it was made. Of course you suggest that it’s made of cheap fake materials. You don’t want to have this thing. You even don’t know where to put it in your home. After that cheating part, you suddenly say: but even if it’s made of plastic or other cheap materials, I would love to have ten of these awards. Since it stands for a very important value of life. Fill in the value or belief, and wide out about that value. Tell what it means to us. 13. Use wordplay in relation to the event. 14. Refer to common senses and thoughts. Wink, smile, and say: but of course is the understatement of the year! 15. Make your after dinner speech topics personal. Tell about common personal experiences that draws the public and you closer together. 16. Tell an anecdote to create identification. 17. An amusing story about yourself can build your credibility. She or He is one of us, knows what to do and how to do it, they might think. A self deprecating experience related to the event always works. Spoof a little bit, but don’t make a fool of yourself. 18. Tell an inside practical joke, describe it. 19. State a common known oneliner of the school, company president or your boss. Imitate his or her character, weird expressions, dialect or moods, by changing the tone of your voice. Don’t overact this. Keep it cool and functional, but funny of course! 20. Present funny statistics, expert opinions, quotes and expressions that cause relief or show an incongruity. 21. Look for studies, surveys, facts and evidence that help to understand your thesis of your after dinner speech topics. Show your expertise and credibility. 22. Refer to the accomplishments of well-known members of your public. Perhaps vip’s, special or mystery guests? Award winners? Why is their succes a good example of the thesis? 23. Look for significant results of polls, and concrete and humorous examples. Tell how other communities, schools, companies or clubs have tackled the issue of the event. 24. Talk about important political, economic, international issues in society. Incorporate them in a funny way – not being to grave or somber dispositioning. Pay attention to the audience’s needs and interests, to things they like to hear about. 25. Conclude by listing the supporting points. Use a famous oneliner. E.g. Say: I’ll Be Back … next year, to see if you have done what you want to do! 26. Toast to the success of the purpose of the meeting. 27. The last of all my ideas for after dinner speech topics: Wish them all the best and thank everyone for their attention. Now that you read the example after dinner speech topics in my outline above, determine the occasion and its purpose(s). Always ask: What is the purpose? To help you brainstorming, I have sorted out a few situations at which after dinner speech topics are required. Welcoming – welcome the guests, hosts and praise other motivational keynote speaker for their contribution to the event. Business, company dinner, kick-off meeting – speak about the necessity of the work that has to be done, about your potential or the ways to tackle the problems. Social, family reunion, annual meeting – address the past and the plans for the future. Fundraising event – thank sponsors, donors and raise funds. Tell how the money come in. Work meeting – present the do’s and don’ts of this work session in a humorous way. How to plan, develop, and finish projects. Okay, these are just some examples of speeches. In the next paragraphs, I will show you more. Just pick out the ideas that are appropriate to you. Take a particular interest or a strong point of view as starting point. Keep smiling! Don’t sound angry or negative. Use note cards, index cards or even a print-out of your after dinner speech topics if you aren’t an experienced speaker. Make eye contact with your listeners. Avoid religious humor, racist or ethnic, sexist, and even political humor that could offend or provoke individuals or groups. It destroys credibility. Don’t make your public feel alienated or uncomfortable. I recommend a 8 to 10 minutes time limit. Sometimes even 2 or 3 minutes will do. Ask the hosts. Not longer, you don’t want to be a party killer. Practice your talk in front of a friend, rewrite, time the length, rewrite again and polish your after dinner speech topics. An after dinner speech is performing and serious public speaking at the same time. Your tone has to be light-hearted, your speech topics have to be relevant to the event and your presentation has to be funny. 1. Recognize the atmosphere of the event or celebration. Therefore determine the purpose and the ambiance of the public speaking event or occasion. The after dinner speech is frequently given after the attendants have eaten. Although it is possible to speak before and during dinner. So, keep in mind that the guests have enjoyed good food and drinks – they are relaxed – and willing to listen to some public speaker. 2. Realize to whom you are talking. Try to flow your wordings in the mind set and group unity. Try to be on a similar wavelength with them all. Do you want to inform the audience about important subjects, results, or thoughts? Or do you want to persuade them to change their values, beliefs or behavior? Or do you want to set a social agenda by choosing special or noteworthy topics in your speech presentation? 4. Apply a good sense of humor that is relevant to your message, the audience, the atmosphere and the purpose of the occasion. If you want to discuss a serious or even a somewhat provoking speech topic idea, then always choose for a relaxed and humorous way. 5. Practice out loud, time the length, rewrite and polish the note cards of your thoughts. Yes, notecards – leave written papers at home! 6. Using notecards forces you to organize your myriad after dinner speech topics in a clear structure. Use transition sentences while speech writing to jump to another ideas and points. 1. Avoid religious humor, racist or ethnic, sexist, and even political humor that could offend or provoke individuals or groups. It can destroy your credibility and ambiance of the evening. 2. Do not ask for radical or dramatic changes in your after dinner talk. Only help them to think different sometimes. 3. Don’t sound angry or negative. 4. Ask the hosts how long your talk may last. If they want you to speak for example 3 minutes, then stick to that timeslot. Don’t be a party killer with a never ending after dinner speech. 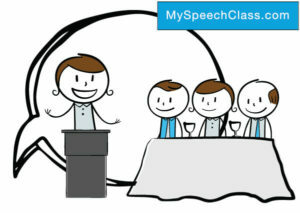 Cite this article as: Jim Peterson, "27 After Dinner Speech Topics and Tips From a Coach," in My Speech Class, May 12, 2018, http://www.myspeechclass.com/after-dinner-speech.html.